YoYoFactory has announced a new promotional tour with 2014 World YoYo Champion Gentry Stein! Full details have not yet been announced, but it looks like Gentry will be making appearances next month in China, Singapore, Malaysia, Vietnam, and Tokyo. 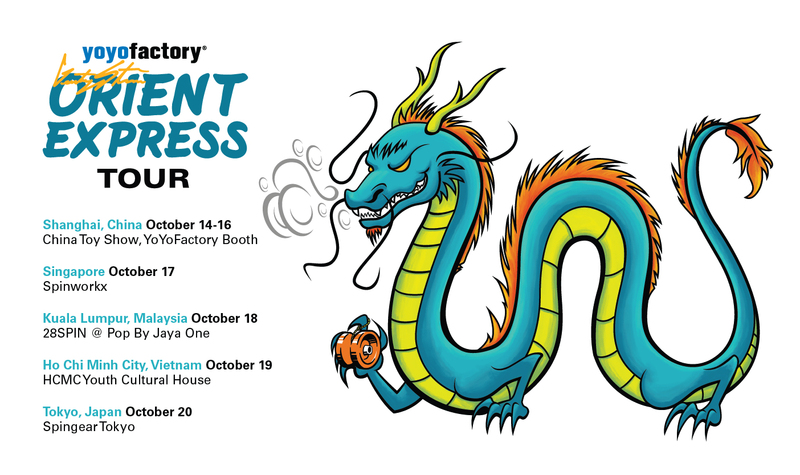 There will be exclusive tour edition Shutters available at each stop of the tour, prototypes of new YoYoFactory models to try out, and raffles for awesome YoYoFactory prizes. 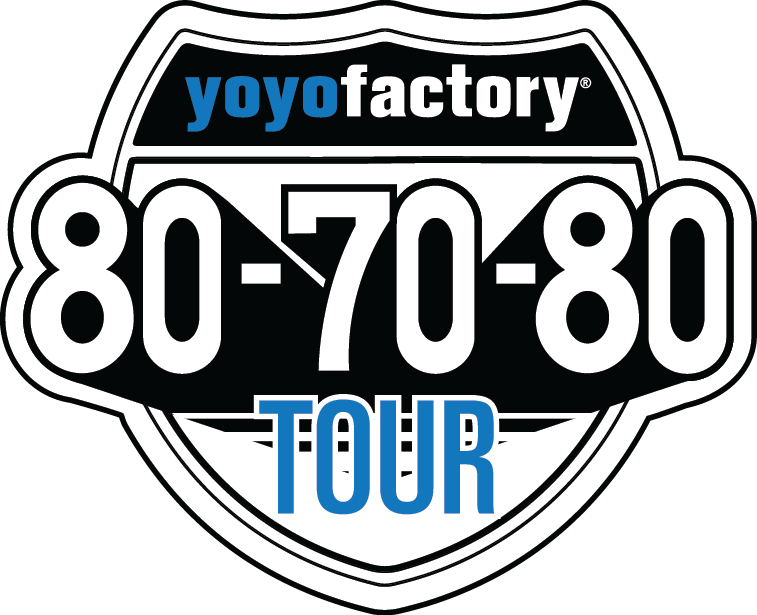 YoYoFactory is back on tour! The gang has loaded up into the van for another run at traveling across the United States and teaching new players about the art and sport of yoyoing. Here is a list of tour stops…keep an eye on their Facebook page for more details. The van rolled out of our base in Phoenix Arizona Feb 19. It wouldn’t be a road trip without some unexpected delays and a new water pump (to replace the one we just replaced!) saw us get to our staging point in SF a little later than expected. The crew onboard, Clint, Joe and Tyler would be de-touring to Seattle for PNWR to collect Ann and get to our first official tour stop, Nevada City California. Where you say? Nevada City Its a small Gold Rush town located 60 miles NE of Sacramento. Why? Why not! The store owners at Mountain Pastimes were super enthusiastic about having us out so here we are! YoYoFactory released their second tour video from this Fall, this one tracking the guys through their tour stops in Santa Cruz, California. 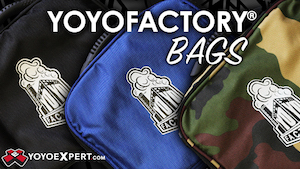 Tons of great stuff in here, and a great look at YoYoFactory’s super effective promotional tours. YoYoJam released a clip video from their recent Minnesota Tour. It’s really great to see them getting into retail-based promotions…here’s hoping we see more from them! Hey guys, it’s Ben Conde. I just wanted to say thank you to everyone who came out to see the team on tour — this past week was an incredible experience for us. You can expect more tours in the future! Please enjoy this montage I made of the Minnesota Tour. Thanks! YoYoJam has announced their very first tour! YoYoJam team members John Narum, Ben Conde, Tessa Piccillo, and Ian Johnson will be touring through Minnesota starting today, June 17th and ending at Midwest Regionals on June 23rd. Just a quick week, but it’s great to see YoYoJam getting their feet wet with promotional tours. Aloha! Come join National Yo-Yo Champions Tyler Severance and Alex Garcia as they tour Hawaii! Hot (or cold rather) off the YoYoFactory Rocky Mountain Tour, Tyler hits the island for some fun in the sun! Bellow are the current tour appearances that Tyler and Alex will be at. Come by and meet the Pros, learn some tricks and pick up some awesome yo-yos from our retailers! And don’t forget, Friday, May 3rd, the YoYoFactory 808 YoYo Contest will be held below the old spaghetti factory! Be sure to come, and bring your friends! YoYoFactory has wrapped up the 2nd leg of their Rocky Mountain Tour in Fort Collins, Colorado and it looks like they’ve made a ton of new players in the area. It’s great to see manufacturers doing serious grass-roots promotion like this, and I hope we start seeing other manufacturers follow suit! What better way to start of the YoYoFactory Rocky Mountain Tour then, in the Rockies! As part of the tour, we set up at the USASA Snowboard National Contest in Copper, CO. From the minute we set up, people were hanging out playing Yo-Yo. Quite a few people already had skills and were throwing modern unresponsive YoYoFactory. Expect to see plenty more updates as they wind their way through Denver, Colorado Springs, and Fort Collins. YoYoFactory is hitting the road again, and doing a three-week tour in Colorado! The team will be spending one week each in Denver, Fort Collins, and Colorado Springs. Full details below. YoYoFactory is proud to partner with the USASA as a sponsor of the 2013 Nationals. We will be on site teaching, showing off, running contests and you can even pick up some yo-yos if you want! On Friday, April 5th YoYoFactory will be holding the Denver Yo-Yo Contest at Timbuk Toys. We invite you to come out and enjoy this awesome event. We’re going to have fun contests to enter, even if you’ve just started! Please check out the rules here. Please check back for more dates and times to be announced. On Saturday, April 13th we will be holding the Fort Collins Yo-Yo Contest! We’ll have divisions for all skill levels so even if you just started playing with a yo-yo you can enter! Check out all the rules here. Mini contests, Learn how to yo-yo and come meet the Pros! EVERYDAY we will be at YoYo Loco from 3:30 PM – 6:00 PM! Come hang out, learn how to yo-yo and meet the pros! On Saturday April 20th we are holding the Colorado Springs Yo-Yo Contest! We’ve got something for EVERY skill level. From 11-1 we’ll do the Classic Division. This is for all the competitors who are just getting started in yo-yo and it’ll be a lot of fun. After lunch from 2 to 4 we’ll have the Advanced Division for competitors to get on stage and do freestyles set to music. Check out all the rules here. YoYoFactory demonstrator Ann Connolly had a great appearance on Australian television..well worth a look! Yo-yo players around the globe are in for a treat this weekend! In Asia, two huge contests will be held starting tomorrow. The Asia Pacific Yo-yo Championships, in Singapore, will be held from Friday to Sunday at the Hougang Mall. The other big event in the region is the China Yo-yo Corporation Championship in Guangzhou. While it’s unfortunate that the big names will be divided between the two contest, it makes for an exciting weekend nonetheless! In the Americas, the US West Coast will host the Birdhouse Left Coast Tour, which brings along the YoyoFactory team. Also in the US, the traditional Mideast Regionals will take place in Plymouth, MI. Down south, Brazil Nationals will be held in São Paulo, celebrating the 10th anniversary of the Brazilian Yo-yo Association. And in just a couple of weeks, the Triple Crown of Yoyo in Chicago, and the World Yo-yo Contest will surely be the highlights of the contest season!